HOUSTON. 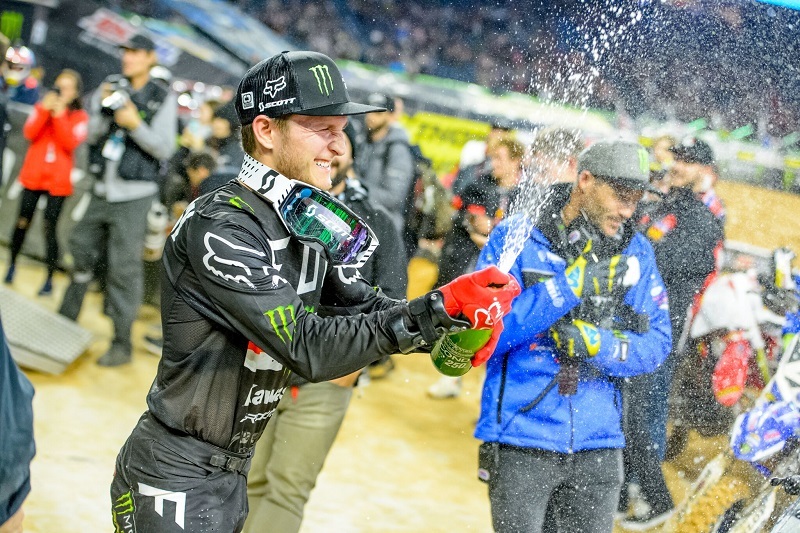 (January 14, 2018) – The Monster Energy Pro Circuit Kawasaki’s Joey Savatgy overcame an ever-changing track inside NRG Stadium to earn his first podium of the season, finishing second in the Main Event. Round 2 started out well for teammate Adam Cianciarulo with the fastest qualifier and heat race win, but a few mistakes pushed him back to finish seventh in the Main Event. To start the night, Savatgy grabbed third in the Heat Race, giving him a solid gate pick for the Main Event. When the gate dropped, he shot his Kawasaki KX250F to the holeshot and led the field around the first lap. He held onto the lead for over half the race, but with a deteriorating track Savatgy raced on the safe side to collect valuable championship points – finishing second. Cianciarulo entered the second round with confidence as he came off a podium finish in Anaheim. He adapted to the track quickly, qualifying first and earning his first heat race win of the season. In the Main Event, Cianciarulo rocketed out to third on the start. Keeping the front runners close, Cianciarulo pushed hard and made a mistake right around the halfway mark. He got up very quick, only losing a few spots and made up the time with his quick speed. With two laps left, Cianciarulo made another small mistake and was forced to finish seventh in Houston.